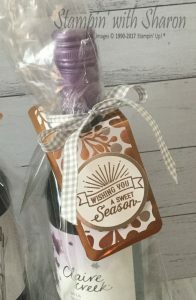 Perennial Birthday Project Kit by Stampin’ Up! Stock the delightful box contained in Stampin’ Up!’s Perennial Birthday Project Kit with birthday cards you make yourself, and you’ll never forget to send a birthday card again! Kit includes components for making 16 birthday cards–4 each of 4 designs–plus the box to store them in. Contact me to order yours today, or visit stampinup.com. I’ll be hosting a class to make these cards. I’ll have all the stamps and inks available for your to use and all you have to do is order a kit and come along to the class. I have a morning class and an evening class on Tuesday 20th March. 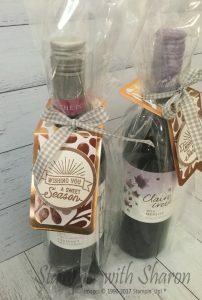 Posted in #imbringingbirthdaysback, Classes, Kits, Occasions Catalogue, Stampin, Stampin' Up, Video, You Tube	| Tagged Card Classes, Perennial Card Kit, Stampin with Sharon, Stampin' Up! Today I want to share with you a card that I made for my eldest daughters Teacher. The class parent was collecting money for a gift for the teacher and I offered to make a card to go with the gift. I also had some Christmas gift tags to go into the gift as I always love giving a handmade gift rather than just money. 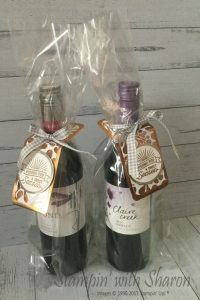 Gift tags are always a more practical gift as they can use them straight away for Christmas. Here is the card I made. 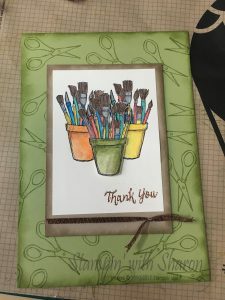 I used the Water colour pencils for this project and enjoyed colouring this card especially as the Teacher is a very creative teacher that coordinates our Art Show every second year. I stamped the image 3 times, twice on Whisper White and then the third time was on another piece of Whisper White then fussy cut it out and popped it onto dimensionals after I coloured it. The hamper was given to her on Wednesday but I wasn’t able to be there unfortunately but have since heard that she loved the card. If you’d like to order any of these products please check them out on my online shop and if you use the hostess code of the month then I will send out an extra special thank you to you for your order. For my final project from my 12 Days of Christmas Series I have the Secret Santa Gift that I made for our Team Christmas Party. I used the Merry Music Specialty Designer Series papers for my inspiration. I made a little bonbon and some half bonbons to put product and chocolates in. I used the labels I’d made on previous projects on the bag and the Jar of Malteasers. I purchased the little jar from Kmart. I also make up a little box for some ribbon that uses no adhesive and can fold flat. The box was originally made by Sam Hammond from Pootles. If you’d like to have the opportunity to be a part of a Secret Santa at our Team Christmas Parties then join my ProCRAFTinators Team. You can join my team by clicking here and find out more about joining Stampin’ Up! Day 10 brings two passions together for me. Essential Oils & Papercrafts. 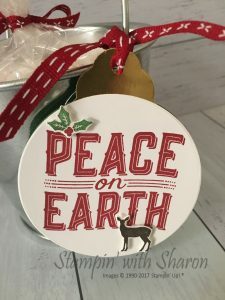 I made the tag using the Carols of Christmas stamp set and the Layering Circle Framelits. I also used the Pretty Label Punch to make the Gold Foil topper with Cherry Cobbler Double Stitched Ribbon. I have made some Bath salts with my Essential oils. I used Himalayan Salt, Epsom Salts, Bicarb Soda and some Young Living Lavender Essential Oil. 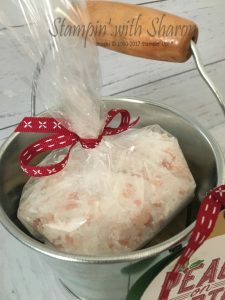 This would make a great gift for the hard to buy for person that loves baths. If you are interested in Essential oils you can contact me for further information. If you’d like to sign up to have an account then you can do that here. Signing up is a great way to get a discount on all your oils and to kick out those chemicals that are in the home. I’ve been using these oils for over 12 months now and am slowly changing over the chemicals in my house for natural products. Today’s post brings a gift for one of my husband’s suppliers. We wanted to thank this supplier for all the support that they have given to my Husbands business Ministry of Tech. I used the Year of Cheer Specialty Papers on this project along with some foil sheets in Copper & Champagne. I’ve listed all the products below. Day 7 brings these cute little bon bons made from the Year with Cheer Specialty Designer Series Paper. I had a request for some boxes for a Christmas table that would hold 2-3 chocolates. This is what I found on YouTube. 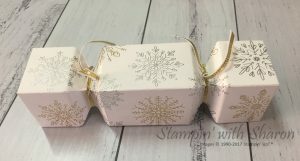 I love these little boxes so much that I’m going to make some for my Christmas table this year. These are just two designs of from the Year of Cheer Specialty Designer Series Paper which is on the retiring list till its sold out. 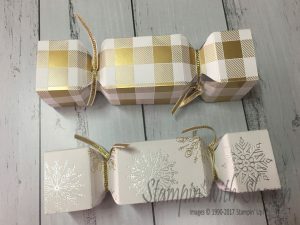 I found a video on how to make these cure bon bons at Intertwyne Designs. They are so cute and I had to make them. There is a also a box that she made to fit 4 of these into. For my Day 5 project I made up a jar with “Reindeer Noses” inside which are Malteasers and Jaffas. Its a cute little project that anyone would love. A great gift for kids too though maybe a bit too much chocolate. 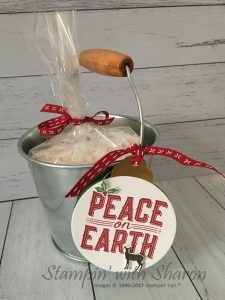 I’ve used the Merry Music Specialty Designer Series Paper, Green Sprigs, Mini Ornaments & Black Shimmer Ribbon and purchased the glass jar from Kmart. I’ve listed all the products used at the bottom of this post. All orders that have this Hostess code will receive a thank you gift from me.